As part of its ongoing participation in science research and space exploration, Babbitt Ranches has invited planetary geochemists and microbial ecologists to Black Point Lava Flow. They are studying the relationship between microbes and manganese in a thin layer of rock covering known as “rock varnish” and through this research, are hoping to gain a better understanding of the possibilities of life on Mars. scientists encouraged about that planet’s habitability. “On Earth, usually when we find manganese we find evidence of life, but we want to know whether or not that might also be the case for other planets,” said Cal Tech biology professor Woody Fischer, Ph.D. The project is called “Life on the Edge: Microbes in Rock Varnish.” Scientists want to know how rock varnish forms and what role life may play in its formation. Varnish is typically not found in abundance in volcanic rocks, but exists at the Black Point Lava Flow, part of the San Francisco Volcanic Field near Flagstaff. Nina Lanza, Ph.D., a Los Alamos National Laboratory planetary geologist who has been involved in NASA’s Desert RATS (Desert Research and Technology Studies) astronaut training projects, spacesuit tests and rover excursions on Babbitt Ranches in the past, says the relationship between microbes and rock varnish has been a source of long-standing controversy. “We want to know if microorganisms drive the formation of varnish, oxidizing manganese and iron to gain energy, or, if they instead use rock varnish as habitat. The answers to these questions have important implications for our understanding of how life on Earth has evolved to capture and harness energy from the physical environment,” she said. 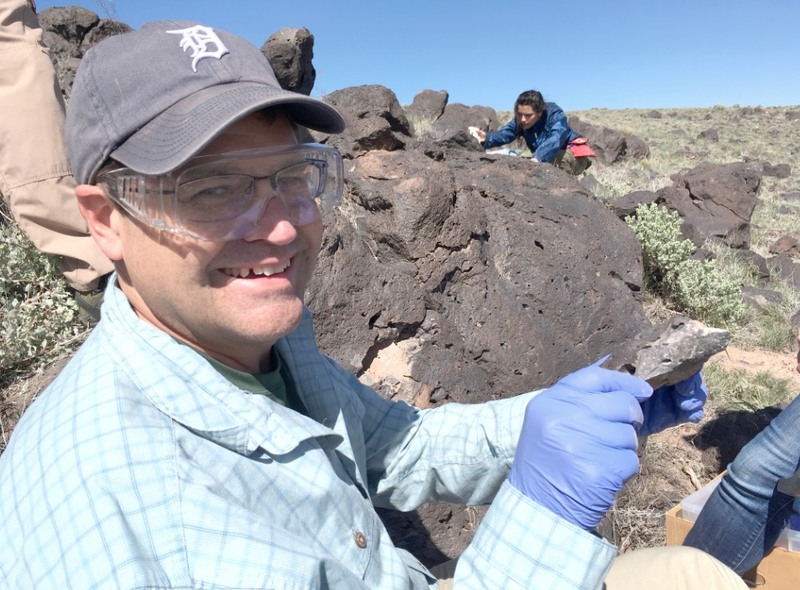 The researchers have chipped and chiseled away 20 or more samples of the rock varnish, a shiny dark manganese-rich coating covering basalt at the lava flow north of Flagstaff. Microbial physiologist and ecologist Chris Yeager, Ph.D., is taking the collection back to the Los Alamos National Lab in Northern New Mexico to study the tiny organisms living in the crevices, pores and layers. Lanza is an expert in laser-induced breakdown spectroscopy, a technique using light and heat to understand the composition of rocks. Through instruments on the Mars Curiosity Rover, she is currently gathering data about the Martian surface. Babbitt Ranches has been involved in space exploration research since the Apollo training missions. In the 1960s, U.S. Geological Survey scientists worked with astronauts on the rocky landscape around Black Point to learn how to maneuver through the volcanic surface and identify rock samples. Babbitt Ranches cowboys made the site more moon-like by creating a crater with dynamite. Easy access to the lava flow and the similarity to extraterrestrial surfaces have helped space mission engineers test equipment and study geology on the Moon and Mars through NASA’s Jet Propulsion Laboratory (JPL) and the Johnson Space Center Desert RATS program. The Babbitt Ranches Landsward Foundation strives to advance the understanding of ecological, social and economic factors affecting the lands of the Coconino Plateau Region and the Little Colorado River Valley. Ongoing science projects include golden eagle monitoring, pronghorn antelope studies, the reintroduction of the endangered black-footed ferret, rare plant findings, archaeological site stabilization, vegetative climate change research and other conservation efforts.